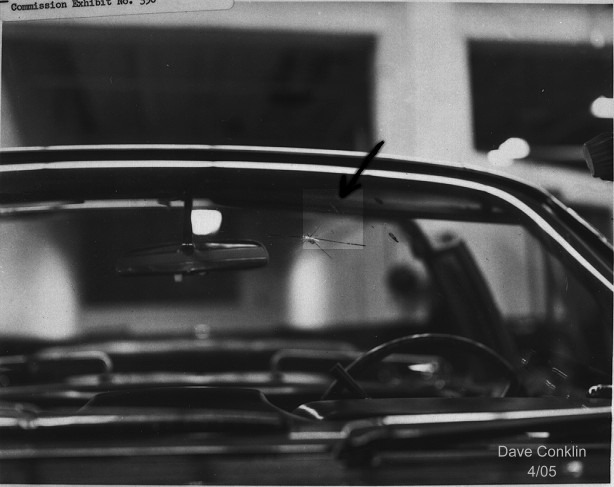 Left: CE350--the Secret Service image of the damage to the windshield of 100X. The photo on the right is my own creation. The dot is a piece of masking tape affixed to the windshield of one slightly used Lincoln Town Car. A comparison between one of my own and Altgens 1-6. Compensating for the longer front-end of the Town Car and the extra length of the Continental, I believe the angle is pretty darn close. Some have pointed to the bright area just behind JFK's left ear in the Altgens photo and purported it to be the bullet damage seen in CE350. Everyone is welcome to their own opinion, by my personal contention is that it is nothing more than the pleat of a girl's dress in the background. Left: My interpretation of Altgens 1-6 (never claimed to be an artist). Right: Zapruder frame 253, the frame which I think best corresponds with Altgens 1-6. Left: CE350. Right: A crop of Altgens 1-7; the image has also been reversed. The photo was taken just after the headshot as the limo was moving away from A.P. photographer James Altgens. It might look like a hole, but it's only an illusion. Dec 08, I must have viewed the following composite a hundred times, but the other day I happened to notice that the damage to the visor shown in CE349 is also visible in the Kelly Air Force Base photo. If you look closely at the crop of CE349, in the middle of the composite, you will see a small "protuberance" in the tear just below the visor rod. It is hard to make out, but the bump can also be seen on the left in the enhanced crop of the Kelly Air Force Base photo (visor in the up position). 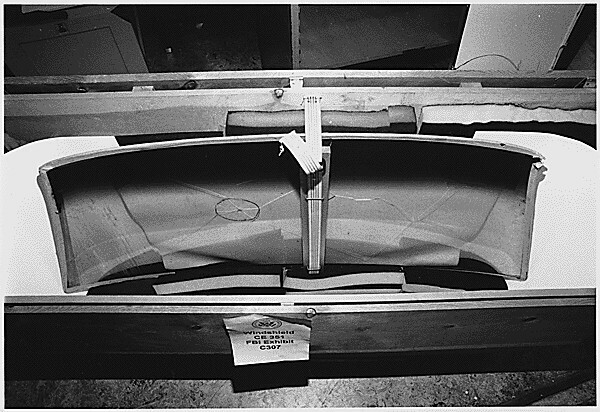 This does not prove that the indentation in the chrome strip was there before the assassination, but it does lend credence to the story given by SA Geis to SS Chief James Rowley concerning the indentation. In other words, it looks as though the visor could very well have gotten pinched between something, say, a hand crank and the chrome strip. 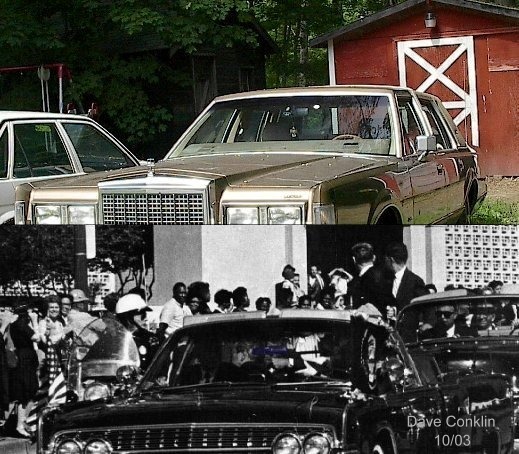 Left: An enhanced crop of a photo taken the day before the assassination at Kelly Air Force Base. Center: A crop of CE349. Right: My own sketch. I originally created the composite to depict the damage to the visor clip. A possible mark on the driver's side visor that (in the flipped up position) would be in exactly the right place and exactly the right angle as to align with the bullet fragment seen by Royce Skelton. (You might have to crank up the brightness on your monitor to see this one). 8/28/18: I recently came across a photo (A bullet hole...) taken at Parkland Hospital that clearly shows the same side of the driver’s side visor, and there is no mark to be seen. So the oblong mark must have been nothing more than a spatter on the windshield that, for some reason, appears brighter than the visor. This JFK autopsy photo was only (unofficially) made public about 1993. However, there was apparently some confusion as to the correct orientation of the photo. Thanks to some real super-sleuthing and brain straining by a couple other JFK researchers and myself, I think--by George--we finally got it. See the white spot on the pavement in front of the motorcycle in frame 143? Is part of it still there in 144? Hard to say, but given the fact that both Stavis Ellis and Virgie Baker insisted they saw a bullet richochet well before the headshot, it could very well be the shot that missed. My attempt to settle the whole bullet angle issue. I painstakingly documented every measurement used including camera distance and angle. 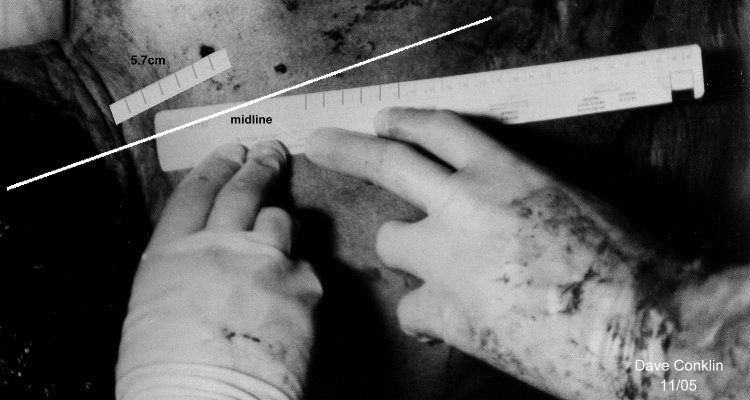 The original autopsy photo was apparently taken with what would compare to a wide-angle lens on a standard 35mm camera (the photo has been cropped on one side to fit the montage). My photos were taken with a digital camera with a comparative field of view. 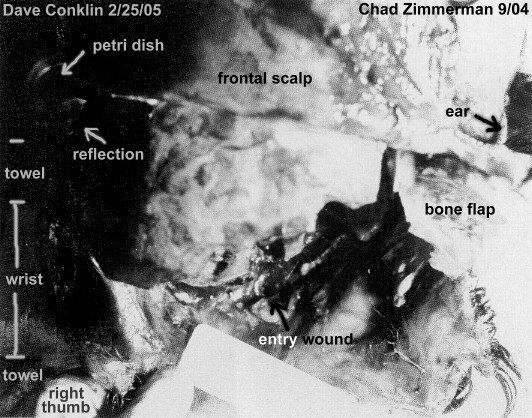 To clarify: A 24-degree angle applied to the autopsy photo should be representational of an 18-degree bullet path through the corpse. Pretty self explanatory. I enhanced the heck out of this digital file using brightness and contrast adjustments, added some new centimeter marks over the barely discernable ones on the ruler, and then cut and pasted a section of the ruler.